Continuing along the Marvel 80's theme of the last few Passport Stamp's, the latest comic fan to follow IADW is ROM Spaceknight fan; The Dude. 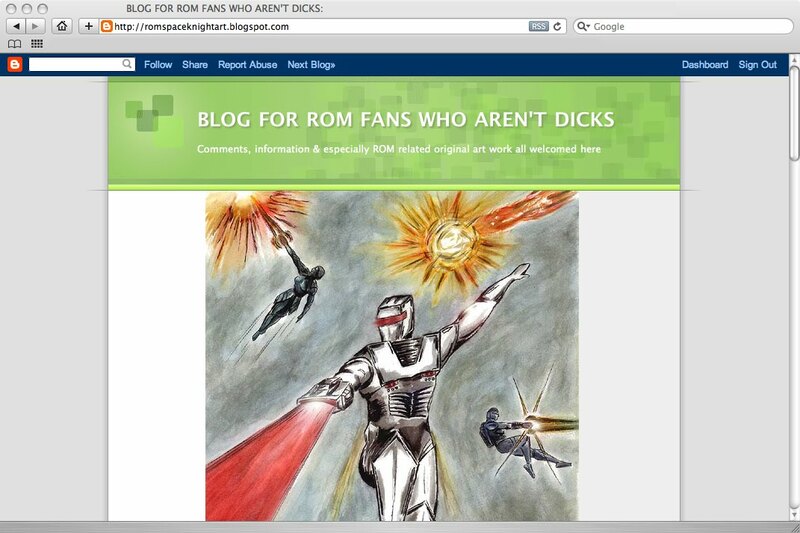 The man behind the Dude, David, also rus his own site titled Blog For ROM Fans Who Aren't D!cks. On it you'll find a whole heap of fan art (some by David himself), along with facts and flashbacks on the shiny cosmic cosmonaut and his friends and allies! Welcome to IADW David, glad to have you aboard! many thanks Dan for giving my blog a plug. and for leaving the comment. even if that turns out to be a hoax i hope you at least found today's posting amusing. i'm not sure however what the "passport stamp" concept is exactly, maybe you can clue me in? i passed along your blog to some friends. there's a hand full of blogs out there like yours that have some really good stuff but hardly any one is commenting on anything. No worries David, 'Passport Stamp' is just a little blog post I do for everyone who clicks 'follow' on IADW. That way with the thanks note on the top right, my response to each comment, and the 'Passport Stamp' for those who follow - I still get to convey to folks my thanks for their support, regardless of the level of interaction each reader is comfortable with. I don't mind if posts don't get comments, it's great when they do, but not essential. I'm just glad people (yourself included) are visiting and including IADW as part of their down time. that's a nice idea. up until maybe early this year i had heard of blogging for a couple of years but had no real idea what it was. it's only been for the past month or so that my ROM blog has been seeing any traffic not to mention the new contacts i've made (like yourself) in the last week. so i'm on a bit of a sci-fi/comic book art geek blogging high right now. i'll settle down down in a couple of weeks or so. The Aquaman shrine is another nice blog for sure and your buddy with the 80s Marvel blog has some good stuff there to. that's how i found your link for the Secret Wars cover vs. poster posting. i'm still trippn on that one. if you want to give me an email address i'll send you the pic of me in my home made Boba Fett costume (i was 14 then) with that poster in the background. and of course i had the first Secret Wars series at the time as well. Hey David - an email link is a good idea to add to my site - thanks! I'll set one up on the right-hand column for all visitors tonight. The guy David is the biggest raciest i know. I am a Jew who is pro-palestinian.......he has made threats against me. Ask the scum David how he feels about christians, muslims, or jews who are anti-zionist.